An oscillating water column (OWC) is a wave energy converting technology that can be installed onshore preferably on rocky shores; nearshore in up to 10m of water; or offshore in 40-80m deep water. The device consists of a large wave capture chamber, a platform for an air turbine, a lip, wing walls, and an air chamber. When waves approach the device, they enter under the partially submerged lip that traps air in a piston type system, forcing the air upwards through the air turbine. This pressure forces the turbine to spin, which is how the energy is harnessed by the waves. As the waves retreat, air enters back into the air chamber from the other side of the turbine. OWC utilize turbines that can be divided into two different groups: turbines with fixed pitch blades and turbines with variable pitch angle blades. The conventional Wells turbine along with axial and radial impulse turbines can be included in the first group. The second group includes the Denniss-Auld turbine (Gareev, 2011). The Wells turbine is the most common turbine in the air chamber. It spins when air is pushed up through and pulled back into the column. 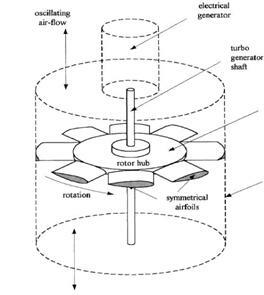 This turbine has the ability to constantly spin in one direction regardless of air flow direction, which allows for optimal energy harvesting (“Islay LIMPET,” 2002). There are several other kinds of air turbines found in OWC: impulse turbines, radial turbines, and the Denniss-Auld turbine. A company in Australia called Oceanlinx has improved upon their Denniss-Auld turbine naming it the airWAVE. It is claimed to be more efficient than any turbine on the market (Takao and Toshiaki, 2012). It has already been established that the OWC prefers rocky shores for onshore/nearshore devices, but they also require a consistent and strong wave climate. Typically, the higher the latitude (above 30 degrees) the better the location for an OWC. Also western shores are best due to the directional patterns of waves (Carbon Trust, 2010). There have been installations in several places around the world: Scotland, India, Australia, Portugal and Japan. Unfortunately North Carolina is not the best location for onshore oscillating water columns. The best locations in the United States can be found in the upper northwest, in Oregon and Alaska. The northeast coast in New England also serves as a decent location, but the northwest has at least 4X greater energy potential. However, there are no OWC projects in the United States at this time. Oceanlinx is an Australian company leading the way in wave energy designs. They have already demonstrated their knowledge in OWC with several test sites. Port Kembla, off the coast of Sydney, Australia, has housed both greenWAVE and blueWAVE technology. GreenWAVE technology refers to the nearshore OWC while blueWAVE OWC are located in deep ocean. The greenWAVE Mk1 OWC operated from 2005 to 2009 as Oceanlinx’s first full-scale prototype. Its blueWAVE project, called Mk3–Pre Commercial, operated from February 2010 to March 2010, and was one of the first floating deep sea OWC to be connected to the grid. The LIMPET, which is the OWC located on the coast of Islay, Scotland, is currently operating as a prototype at 75kW. However, the facility is able to work at a full capacity of 500kW . This is the generating capacity that makes wave energy economically viable and able to compete in the commercial market (Carbon Trust, 2010) The site in India built as a nearshore OWC is operating at 150kW. The Mk3-PC built by Oceanlinx was rated to 2.5MW. The stark differences depend on the construction, air turbine, and wave energy available. Wave energy is currently quite expensive operating at 14 cents per kWh. This is due partly to the expensive installation costs and technology development. Eventually as wave energy become more wide spread the cost will be lowered to a price comparable to wind energy. The environmental impacts of OWC do not appear to be as great as other renewable devices installed in the ocean, and are certainly cleaner than nonrenewables. A Life Cycle Assessment of OWC calculated that the carbon emissions over 25 years, including construction, installation, operation and decommissioning, would be 24 grams of carbon dioxide (Oceanlinx, 2012). 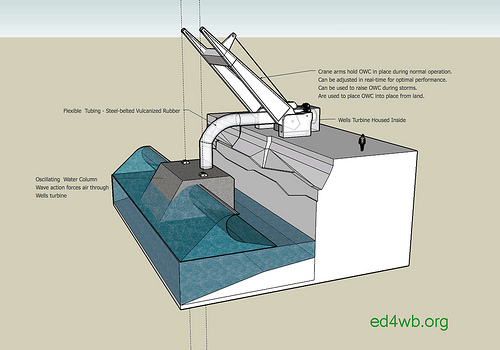 OWC do not have any moving parts underwater, meaning no organisms will get caught inside of a turbine. Several issues that have been discussed regard the visual aspect of having an OWC onshore or right offshore: it would destroy the view and would generate noise pollution. However, if located in deep sea, it would be far enough offshore so it could not be seen or heard. The OWC itself will operate as an artificial reef to increase the marine species in an area. Carbon Trust. Shoreline and Nearshore OWC Wave Energy Devices. Rep. N.p. : n.p., 2010. Docstoc. Web. 25 July 2012. Drew, B., A. R. Plummer, and M. N. Sahinkaya. “A Review of Wave Energy Converter Technology.” Rev. of Wave Energy Converter Technology. Proceedings of the Institution of Mechanical Engineers 16 June 2009: 887-902. Web of Science. Web. 22 July 2012. Gareev, Andrei. Analysis of Variable Pitch Air Turbines for Oscillating Water Column (OWC) Wave Energy Converters. Thesis. University of Wollongong, 2011. N.p. : n.p., n.d. Print. 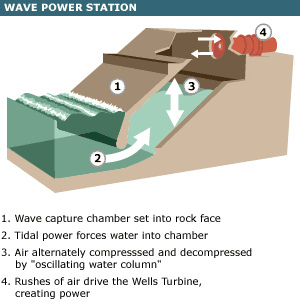 “Islay LIMPET Wave Power Plant.” The Queen’s University of Belfast, 2002. Web. 24 May 2010. <http://www.wavegen.co.uk/pdf/LIMPET%20publishable%20report.pdf>. “Oceanlinx | Wave Energy Technology.” Oceanlinx | Wave Energy Technology. N.p., n.d. Web. 22 July 2012. <http://www.oceanlinx.com/>. Takao, Manabu, and Toshiaki Setoguchi. “Air Turbines for Wave Energy Conversion.” International Journal of Rotating Machinery (n.d.): n. pag. Hindawi Publishing Corpoation. Web. 22 July 2012. Webb, Ian, Chris Seaman, and Gordon Jackson. Oscillating Water Column Wave Energy Converter Evaluation Report. 4 Feb. 2005. Raw data. The Carbon Trust, n.p. Does this device not utilize any working hydraulic fluid during its operation? If so, have you considered the environmental impacts of this fluid leaking out of the device any being carried out to sea by the tide? It seems that this would be a very serious environmental and economic concern before this technology can be proceed. Despite this potential impact, I find this technology to be quite resourceful, specifically because it is used on the actual coastline and not directly in the water directly. Allow erosion is a potential issue, it is refreshing to see technologies that can be used outside of the water. Have you read anything regarding hurricane potential? I’d imagine if the waves were kicking up on shore that these units would be able to generate a larger amount of energy. Of course, if the above mentioned problem with leaking hydraulic fluid is a problem then hurricane operation is probably not the smartest option. As far as I have read there are no hydraulic fluids concerned with the onshore OWC. No mechanical parts are submerged underwater. Everything that operates as far as energy generation is above water and driven by air. Near shore installations may be more of a risk environmentally because they are directly disturbing the marine life and it has to be connected to land as well, but I do not believe that it has hydraulic fluids either as it works the exact same way as an onshore device just further out to sea. For your other question about hurricanes and strong surges, there have been measures taken to help prevent over capacity. The OWC devices have bypass valves in the chambers which control the speed of the turbine blades based on pressure in the columns. If the pressure becomes too great the turbines are slowed so that they do not spin too fast and break or generate too great of an electricity potential. There is a limit though and researchers are still doing work to figure out what to do about extreme cases such as hurricanes. I was wondering about hurricane damage as well, actually. Bypass valves sound like a good measure to prevent damage. Would it ever be a problem if the turbine itself got too wet from really high waves? Is it supposed to stay dry? I looked up more stuff about hurricanes and OWC and didn’t find much. One problem some engineers encountered was that their structure was destroyed during the construction phase due to a hurricane because it hadn’t been fully secured to the sea bed. one of their conclusions was: “Any future device would need to look at the weather exposure risk incurred between installing and ballasting the structure.” So I guess timing is of vital importance to installing these, more than anything else. Source: The Carbon Trust, Oscillating Water Column Wave Energy Converter Evaluation Report. 2005. We have The Automatic Pitch Turbine that can be used to develop power from an OCW or Oscillating Column of Water system. The Automatic Pitch Turbine is more efficient than the Well’s Turbine because it has an attack angle of 45 degrees in both direction of the air flow. The Automatic Pitch Turbine’s pitch is automatically adjusted to the correct angle by the direction of the air flow. The speed of the turbine is controlled by the Sea Wave Turbine Speed Control that runs parallel to the Automatic Pitch Turbine. The turbine has a patent and patent pending in the U.S.A. We are interested in Licensing or selling this patents. We would like to know how we can contact some of your company personal that would like to take a look at what we have without no obligation. Yay another site for my since fair project! Thanks, My project title is The Design, Construction and testing of a wave turbine. this is one of the sites that made me want to test this one too. this is not a (elementary project so it will be complex). @thbeekk – you obviously didn’t even read the article. Of course the system uses hydraulic fluids… SEA WATER! just wanted to know the materials that would be used to build an oscilating water column? Hi there, You have performed an excellent job. I will definitely digg it and in my opinion recommend to my friends. I’m sure they will be benefited from this site. Yeah – totally reliable. I am only in Grade 8 and I used it for a science assignment. Teacher said I had the best info so far, and asked how much research I did, and I said about 5 min. I told the class the website and everybody used it. Now I am top of the class. Thanks, Energy and the Enviroment! can someone guide me about specific requirements for OWC?for example does this technology need certain tidal range? or in what kind of area OWC can be installed?